In my quest to make all my patterns available in printed form, I've updated and expanded my Scraps Squared pattern. It now includes baby (48" x 48") and queen (90" x 90") size options, along with the original throw (60" x 72") size shown. This is one of my favourite patterns because I love anything that lets me use up some of my scraps 😊 I don't know about you, but I could probably make 6 more of these without running out of scraps! Sewing the 4 patches together is a great leaders and enders project, which is exactly how I made mine (plus all the ones I still have sitting in a baggie waiting to be used, lol). 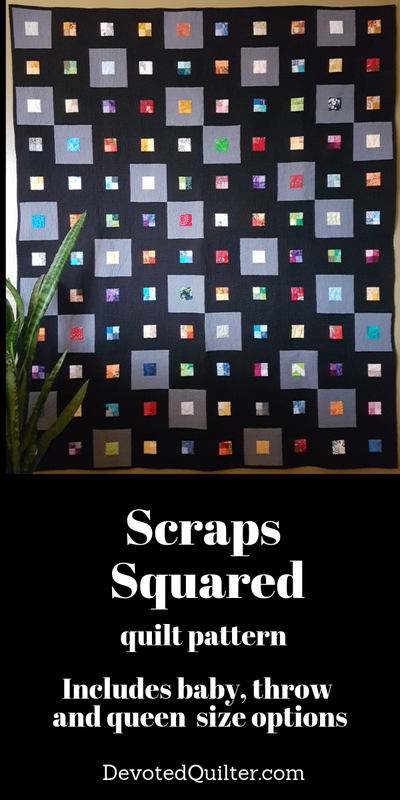 You can get the updated Scraps Squared PDF pattern from my Etsy or Payhip shops. Printed patterns will be available soon. What colour background would you use? 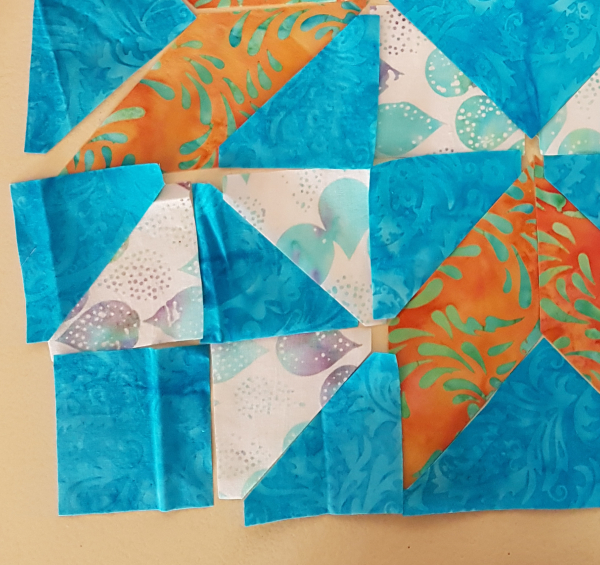 I'm thinking a blue background would be great, though that would eliminate a good portion of my scraps, since blue is definitely dominant in my scrap bag! Jesus told us straight out, "Here on earth you will have many trials and sorrows" (John 16:33). We won't all face the same things, but every single one of us will have problems of some sort. Unfortunately, some of the problems people face make them feel completely alone, separated from everyone, and like no one else has ever experienced the trouble they're facing. None of those things are true, but the feeling of it can be overwhelming. I find that this is true, especially, of mental illness because of the stigma that has always been attached to it. People who are dealing with depression or anxiety often don't want to talk about it because it feels like a weakness or a character flaw in a way that having a physical illness doesn't. Opening up to someone, though, can sometimes bring relief when you discover that the person you're talking with knows exactly what you feel. I saw that happen recently when I was a part of a conversation in which one person talked about his recent struggle with depression. Another person said to him, "If it's any comfort to you, I've been where you are and I came out on the other side." You could see the man's face change as those words sank in and he felt the hope that was in them. I've been there. These are powerful words to someone who feels alone and lost. I know a young woman who is walking the difficult road of infertility and who started a blog to document her journey in the hopes that it would help someone else to not feel alone. I know another woman with a chronic illness who posts often about her treatment on IG and FB and connects that way with others who have to have similar treatments so they can lift each other up. Connecting with others who understand the specifics of our situation can lessen the feelings of separation, of no one having gone through what we're going through. It can make us feel seen and understood rather than alone and lost. Paul tells us that God "comforts us in all our troubles so that we can comfort others. When they are troubled, we will be able to give them the same comfort God has given us" (2 Corinthians 1:4). His comfort is all around us, residing in people who understand what we are going through and can give us comfort through that understanding. 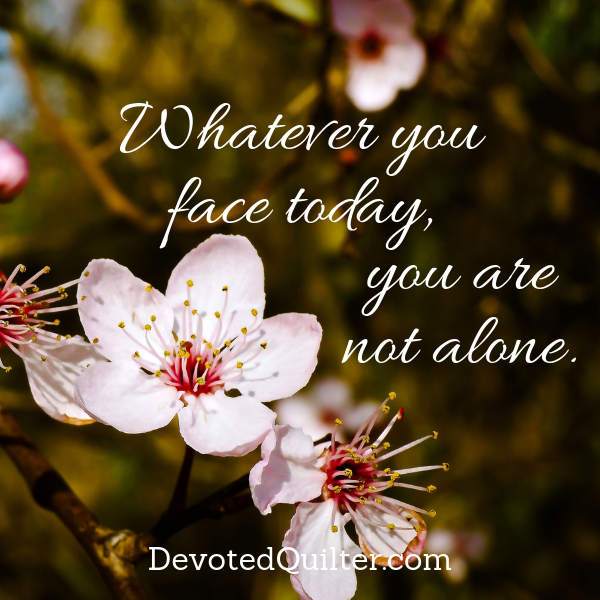 Whatever you are facing today, know that you are not alone. Reach out to others and you may be surprised by the understanding and comfort you receive. 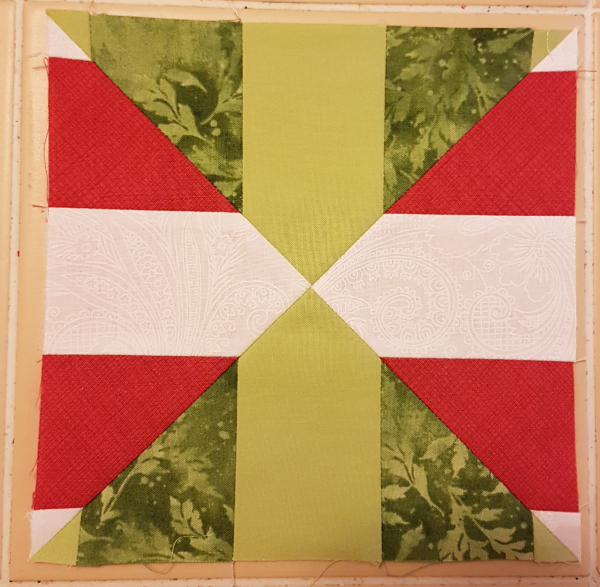 Welcome to my stop on the Dust Off a Quilt Book blog hop 😊 When Bea said she was planning this hop, it sounded like such a great idea I signed up right away. The only question then was, which old book would I use? 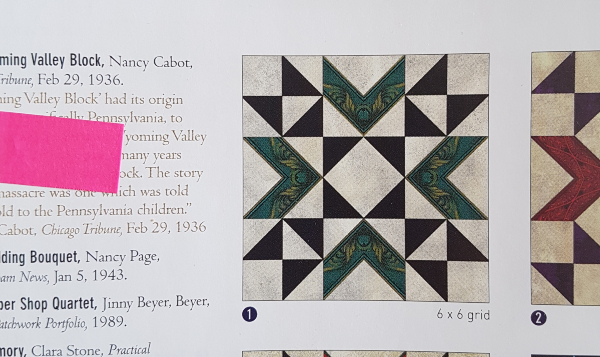 I have so many great quilting books and magazines there's no way I'll ever use them all, but this was a great excuse to dig one out and make something from it, so thanks for the opportunity, Bea! 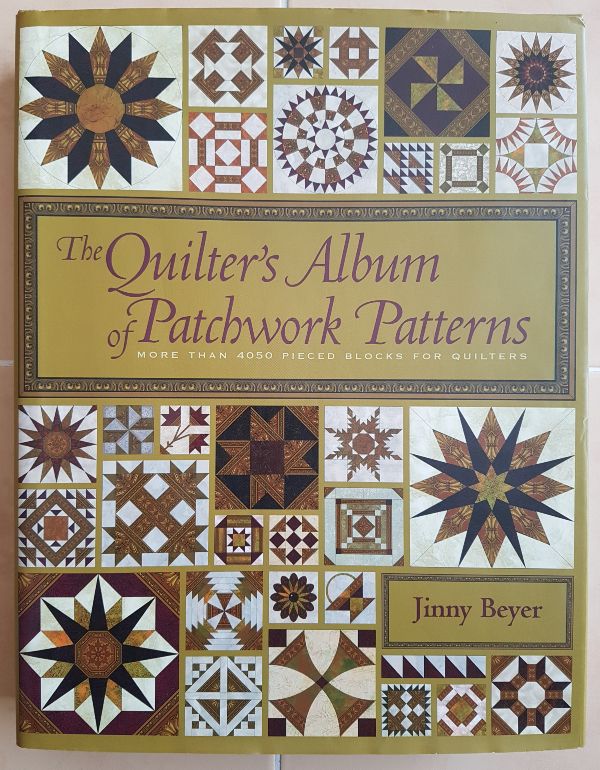 I chose to use this book by Jinny Beyer. It's a gorgeous book full of eye candy and interesting snippets of information about the blocks and I highly recommend it. I figured it would take me forever to choose a block, since there are over 4000 blocks in the book and I'd have to consider them all before picking. But then I noticed I had a Post It flag sticking out partway through the book. 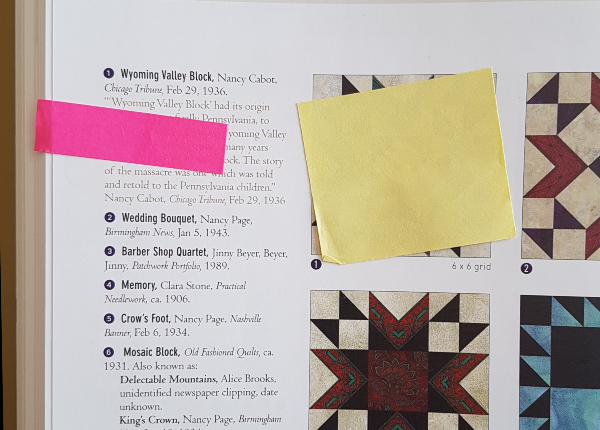 And, when I opened to the page it marked, I found another Post It covering one block and the flag itself was covering the description of the block. Apparently I chose the Wyoming Valley Block for something at some point in the past, but I can't remember when or why. This seemed like the perfect opportunity to make it! And here's my version 😊 I will say that reversing the light and dark from the block in the picture made it more difficult to get all the units laid out properly. 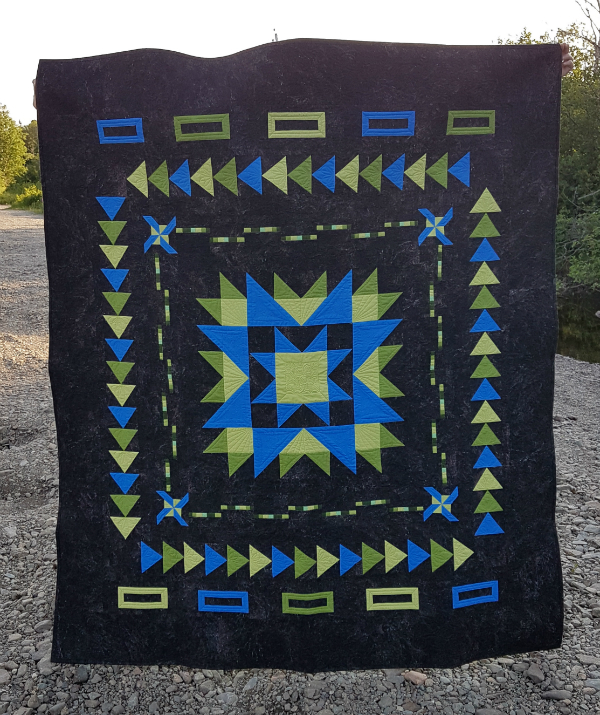 I kept turning the HSTs the wrong way, thinking the blue should match up with the black in the block when really it was the cream that needed to match the black. The orange and cream fabrics were both in the Stash Builder rolls in the Island Batik box of goodies that came a few weeks ago. 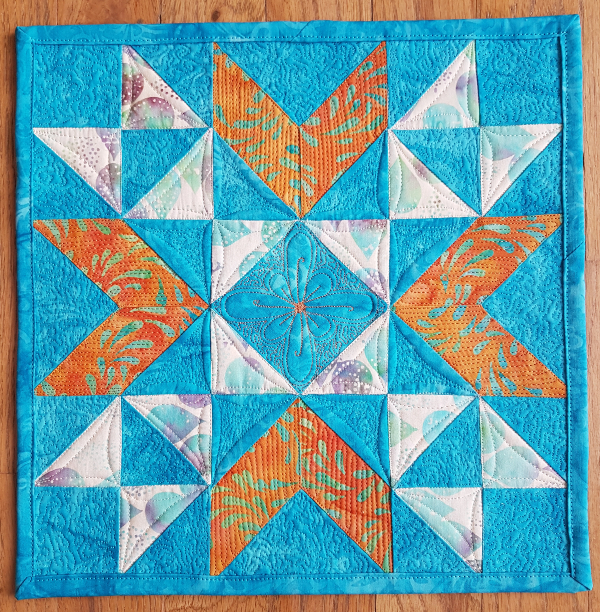 The gorgeous aqua is from the Blossom line and was leftover from my Sparkler quilt. I don't have much of it left now and that makes me sad. It's such a fabulous colour! 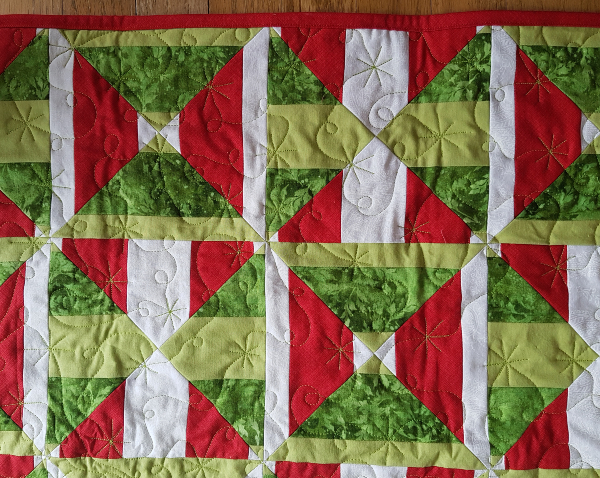 I used my new Accuquilt to cut out all of the pieces for the block, which made quick work of the job. It also meant I had to sew four Y seams, since the orange pieces are parallelograms. It has been a few years since I last sewed Y seams, but I thought I remembered how to do it and the first two I sewed worked perfectly on the first try. The third one took a couple of tries and ended up with a bit of a ripple at the inner point of the Y, but I figured it would look fine once quilted. The fourth one took me more tries than I care to count! I took it apart so many times one evening that I just gave up and left it for another day. Then, when I tried it again, it took another couple of tries before I got it right. Phew! You'd think it would have gone the other way and they'd get easier as I went along, but that definitely wasn't the case. Thankfully, they all looked good in the end and they were even better once they were quilted 😊 I wouldn't even be able to tell you now which one it was that gave me so much trouble. I used a scrap of Warm and Natural batting and I really think the batting scraps are taking lessons from the fabric scraps and have learned to reproduce when I'm not looking. How else would you explain the fact that I keep using batting scraps and yet there always seem to be more?? As per my usual, I worked out my quilting plan as I went. 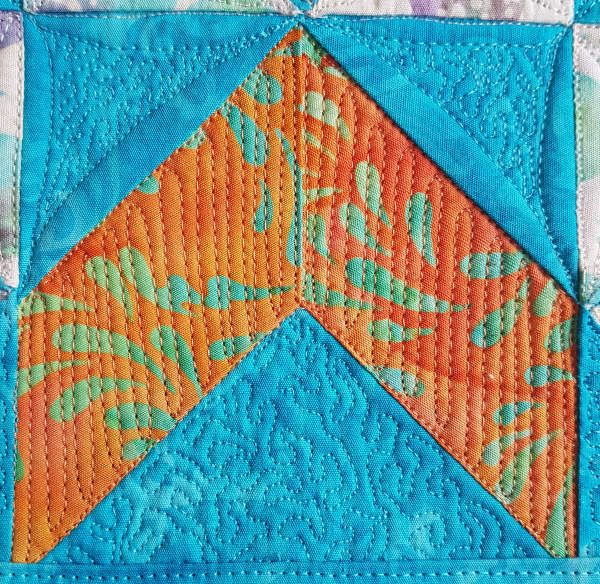 I quilted a quick dot to dot design in all of the cream print triangles first with Aurifil 2311, then did some quick back and forth lines in the orange parallelograms with 2210. 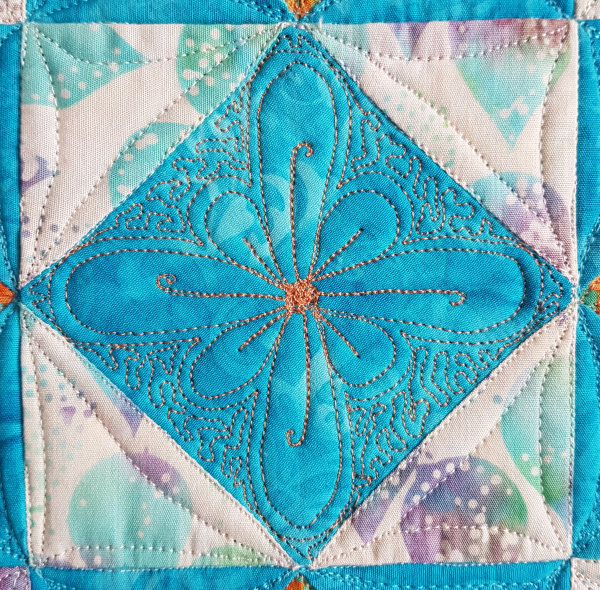 I used 5005 to quilt the same dot to dot design in the aqua triangles that make up the center star, then filled the centers with micro stippling. Then I started doing some micro stippling in the rest of the aqua blocks. I hadn't gone far when my bobbin ran out and as I filled it I realized there was no way I'd have enough thread to finish all of the stippling. 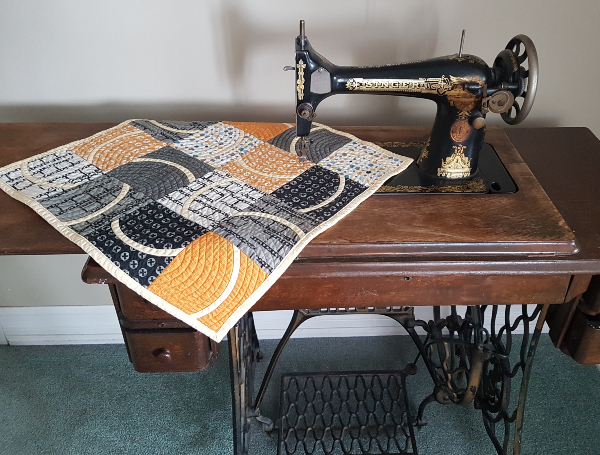 I don't have a local source for Aurifil, either, so there was no chance of getting more in time to finish for the blog hop. Oh no! I looked through my Gutermann thread and found a spool that was almost the same shade, so I used that in the bobbin and used the bobbin of Aurifil for the top. Saved! I even had enough of the Aurifil left to finish the binding, too. I wanted something special for the center square, though, and I didn't have enough 5005 for it. 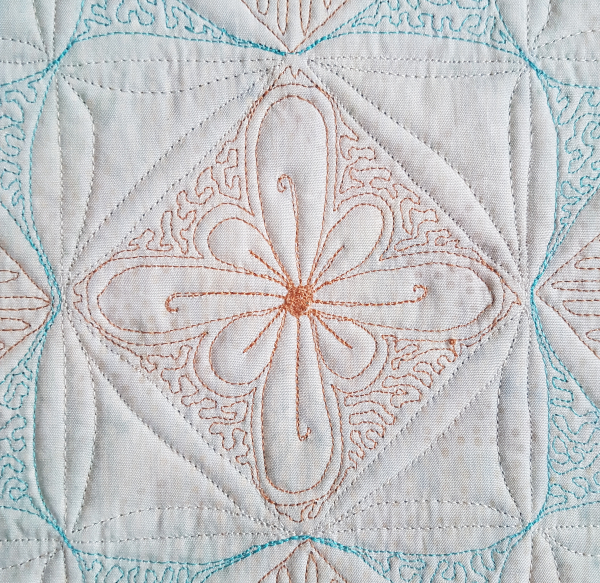 Instead, I chose 2210 and quilted a flower, surrounded by more micro stippling. I love how it turned out! I think I even like it better than if I had used the matching thread I'd originally been planning. 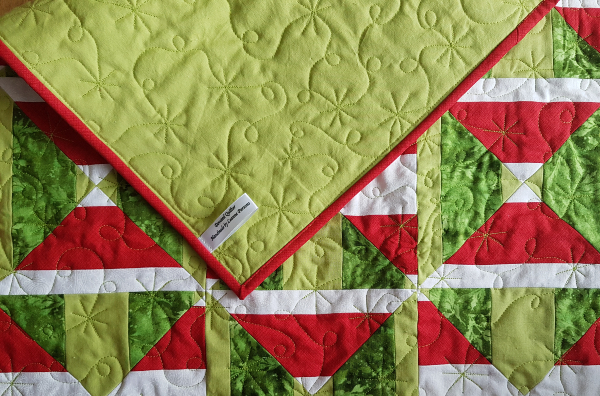 And, of course, I love, love, love how the quilting looks on the back! I used Island Batik's Rice fabric for the back and I like the subtle spots of colour that show through the quilting in some places. They don't show up well in the pictures, so you'll just have to trust me that they're there and that they're very pretty. You would think I'd be used to it by now, but I'm still amazed by just how often working with toddlers reinforces concepts found in the Bible. 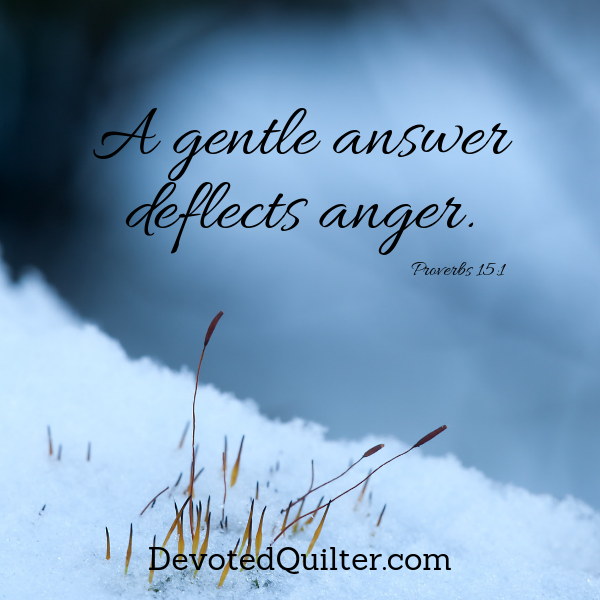 Just last week I read "A gentle answer deflects anger, but harsh words make tempers flare" (Proverbs 15:1) and immediately I could picture it. It's a common occurrence for one child to be sitting and looking happily at a book, when another one leans over and touches the page, causing the first child to squawk loudly and yank the book out of their reach, which then makes the newcomer protest and try to grab the book to bring it back to where they can reach it. The book holder then gets even louder and pulls harder and on it goes until I intervene. Biblical truths are so often evident in toddlers because, at 2 and 3 years old, they haven't yet learned the self control that society requires of us. They don't know to use their words rather than yanking things away or yelling incoherently when something is happening that they don't like. Of course, even after we do learn that self control, 'harsh words' still surface sometimes and make tempers flare unnecessarily. We don't squawk like a 2 year old, but we can lash out and when we do we often find that the person on the receiving end of our words lashes right back. It's hard to respond to unpleasantness with a gentle answer, isn't it? It's natural to want to lash out in some way, which is precisely why we see toddlers doing it all the time, but all it does is escalate the situation. When I have to intervene with the kids, I usually start by pointing out who had the book or toy first, telling the newcomer that it's the other child's turn and they can have a turn in a few minutes. But then I also tell the child who has the book or toy that next time they need to use their words. They can either say, "It's my turn," or they can ask me for help. Either way, using calm words works so much better to keep everyone involved from getting angrier and angrier. It allows us to work towards a solution, rather than just reacting angrily to what is happening in the moment. I wonder how different our world would look if everyone remembered this simple principle. "A gentle answer deflects anger, but harsh words make tempers flare" (Proverbs 15:1). 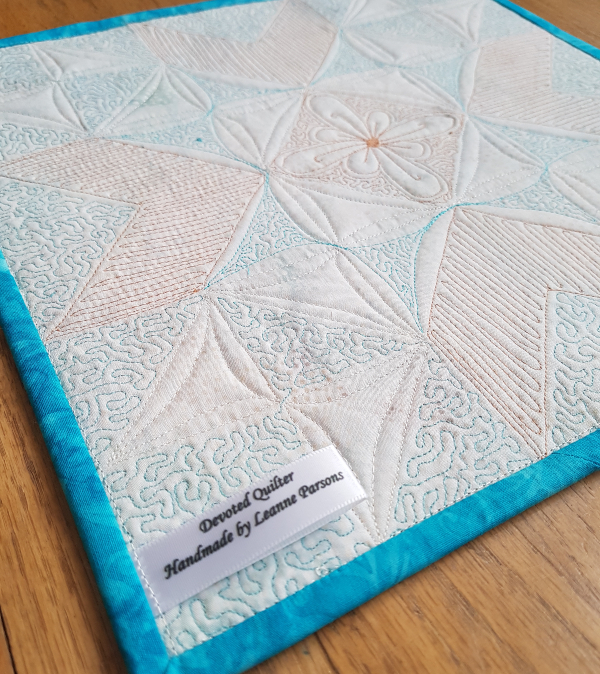 Welcome to Part 2 of the Medallion Magic Quilt Along! 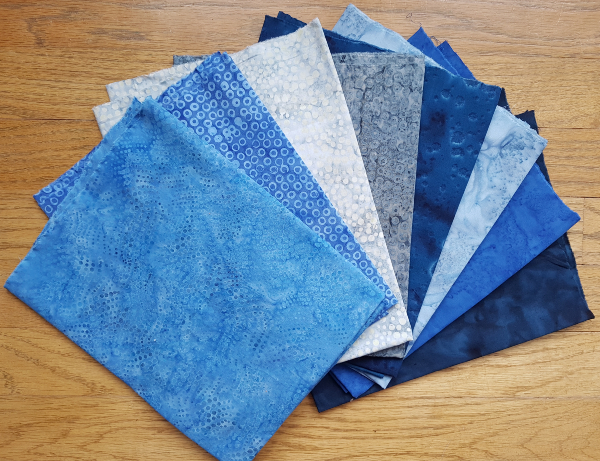 I hope you're ready to cut your fabric this month 😊 If you're new to this QAL, no worries, there's plenty of time for you to join in and I'd love to have you! February 15th - Cutting - today! If you don't have your pattern yet, you can pick up your copy from my Etsy shop in either PDF or printed versions. 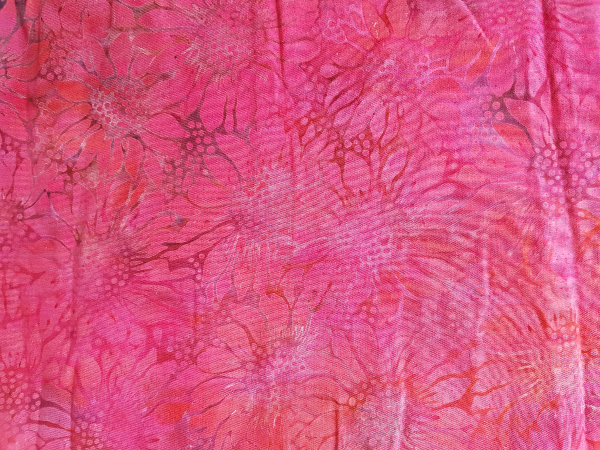 And here's my Island Batik fabric for my QAL version. You know that feeling that you have all the time in the world to get something done and then all of a sudden you realize it has to be done in, like, three days? That's exactly how I felt about getting the cutting done in time to write this post. 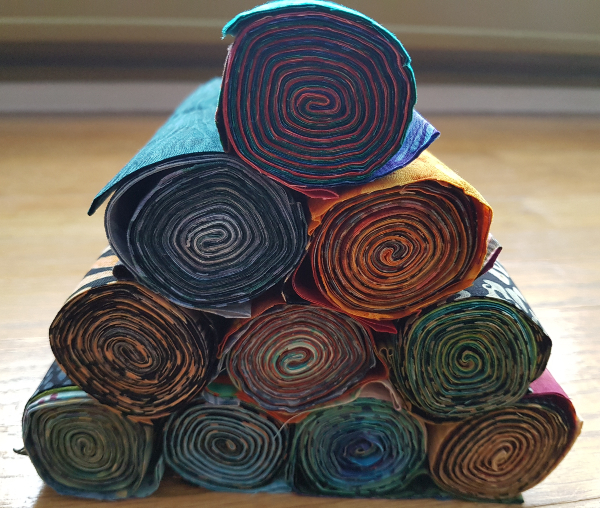 I've had the fabric washed and sitting neatly folded since this time last month, when I took that picture. It was even sitting in my laundry room where I saw it every single day and thought, "I need to get that cut soon." And then somehow it was suddenly Monday the 11th and I realized this post would need to go up on Friday, which meant I actually needed to cut that fabric right away. Ha! I've always been good at procrastinating. I did get it done, though! Let's be honest - cutting isn't the most exciting part of making the quilt, is it? Not for me, at least, which is maybe why I kept putting it off. Please share your best strategies for getting through the cutting of a big project as painlessly as possible 😊 In the past I've watched an episode of something on Netflix, listened to a podcast or even just listened to music while cutting. I've recently discovered the joys of audio books from the library and I imagine that would be a great distraction, too, but I haven't tried it yet. It works for folding laundry and cleaning, though, and cutting fabric isn't nearly as bad as either of those! How do you store your WIPs? I usually default to 'precarious piles stacked here and there' but since I'm trying to be more organized that isn't my preferred method anymore. 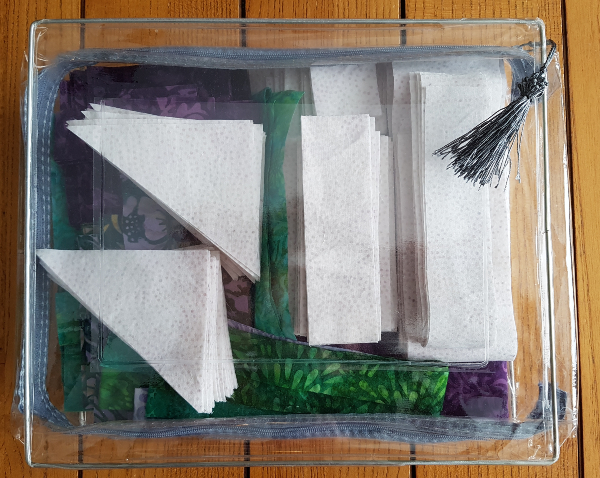 I thought about buying some clear bins to store things in, but I'm trying to reduce the amount of plastic I bring into the house, so that didn't feel like a good plan either. So, I'm storing my Medallion Magic quilt in the packaging from a set of sheets I bought in December. Yes, it's still plastic, but at least I'm reusing it rather than buying something new or throwing this in the garbage. The tassel on the zipper pull is just a bonus! So, that's it for this month. Once your fabrics are cut, link up here so others can see your progress, too. If you're sharing on IG, use #medallionmagicQAL and be sure to tag me so I don't miss it. I'm looking forward to seeing your pretty piles of cut pieces! 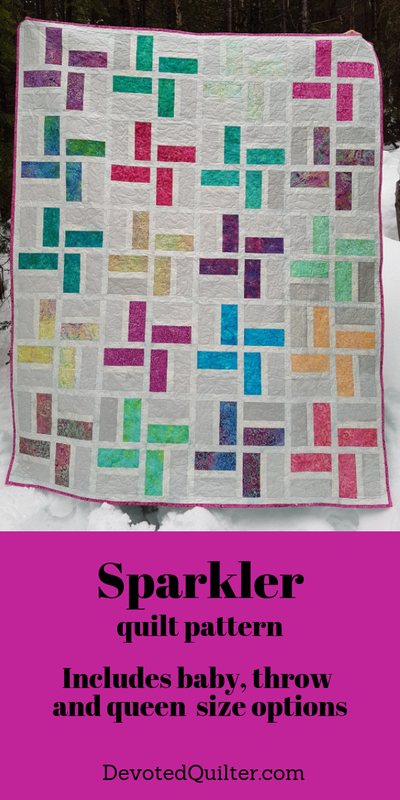 When I shared my Sparkler quilt during the Island Batik ambassador Getaway blog hop, I said the pattern was in the works and now it's ready for release! The Sparkler pattern includes the 57" x 71" throw size shown as well as a 43" x 43" baby quilt and a 90" x 90" queen size. Show off your favourite new fabrics or raid your scrap bins to find some old favourites to highlight. I want to make another version that's completely scrappy, with each Sparkler block made in four different fabrics in the same colour. I also want to make a version where the secondary Sparklers are more noticeable than the grey I used this time. I love them subtle, but I think I'd still love them if they were more prominent. I really wish there were more sewing hours in each day! Sparkler is now available as a PDF download from both my Etsy and Payhip shops and I'll have printed copies available soon. To celebrate the release, it's available at the introductory price of 25% off until Mondary, February 18th. Get your copy of Sparkler today! What colour story will you choose for your version of Sparkler? Back when I was first pregnant with Nathan, we told Aiden and Zachary about the baby, but told them that it was just for us to know about for a little while. Aiden would have been 5 at the time and Zach, 3, and that Sunday morning all the kids were called up to the front of the church as usual. Pastor Hauna asked them some questions and let them answer into the mic. I'm sure you can see where this is going, right? I can't remember what she asked Zach, but his answer was, "There's a baby growing in Mommy's belly!" Now, since he was 3, most people couldn't interpret the toddler-speak, but a few understood. Paul and I just burst out laughing. What else are you going to do? A toddler doesn't understand the concept of 'secret' very well. That story is what popped into my head a while back when I read Luke 12:2,3, where Jesus said, "The time is coming when everything that is covered up will be revealed, and all that is secret will be made known to all. Whatever you have said in the dark will be heard in the light, and what you have whispered behind closed doors will be shouted from the housetops for all to hear!" Taking the verse in context, though, Jesus wasn't talking about secrets like what Zachary shared. He was talking about the Pharisees and their hypocrisy, warning His followers not to be like them. The thing is, the Pharisees lives looked good. To the average person watching them, the Pharisees would have looked like they were living right, with few obvious sins. Unfortunately, it was all about appearances. The Pharisees were strict about how they lived, holding themselves and others to hundreds of religious laws, but they were so focused on living according to the rules that they forgot to seek God. Though outwardly they were godly, inside they were "hidden graves in a field," (Luke 11:44) as Jesus called them. He also called them "whitewashed tombs—beautiful on the outside but filled on the inside with dead people’s bones and all sorts of impurity" (Matthew 23:27). The problem Jesus had with the Pharisees wasn't that they were living wrong, but that they were living right for the wrong reasons. Following all of those rules wasn't a way for them to draw closer to God, it was a way for them to feel righteous and to receive honour from those around them. Though they claimed God was the reason for everything they did, really it was their own need to be recognized for following the rules. This, of course, begs one question: what is our motive for the way we live? Do we go to church on Sundays because we want to worship God or because we know people will talk if we're not there? Do we put money in the offering plate because we want to help with the work of the church or because we feel guilty if we don't? Do we give of our time and money because we know it makes other people think better of us? In Matthew 6:1-17 Jesus talks about giving to the poor and about prayer and fasting, all of which the Pharisees would do with great fanfare, calling attention to themselves so they could get proper credit for what they were doing. That was exactly what Jesus meant when He spoke about their hypocrisy. They weren't giving to the poor to help the poor. They were doing it to help their own image and it worked. Other people were duly impressed. God, however, was not. Jesus said, "I tell you the truth, they have received all the reward they will ever get" (Matthew 6:2). Though our motives might be secret from the people around us, they aren't secret from God. He knows what desires drive our actions, maybe even better than we do. One day, those secret motives will be made known to all, just like Zach telling the church about the baby to come. When that time comes, will the recognition and acclaim we sought be all the reward we're ever going to get? 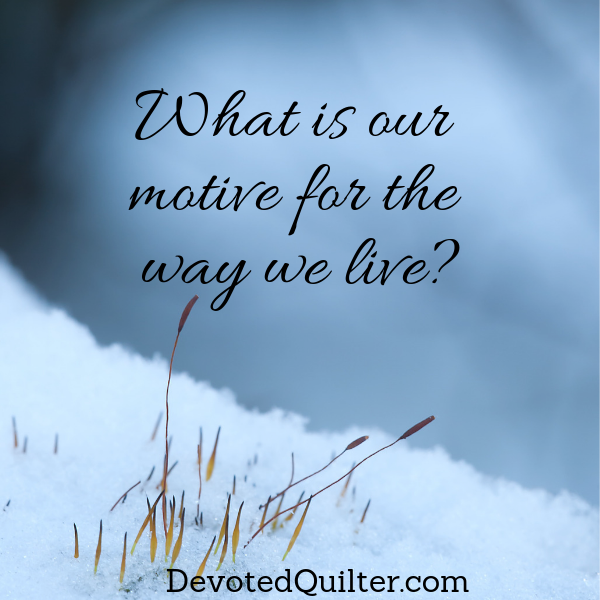 Or will God reveal that He was our motive for everything, and He will be our reward? 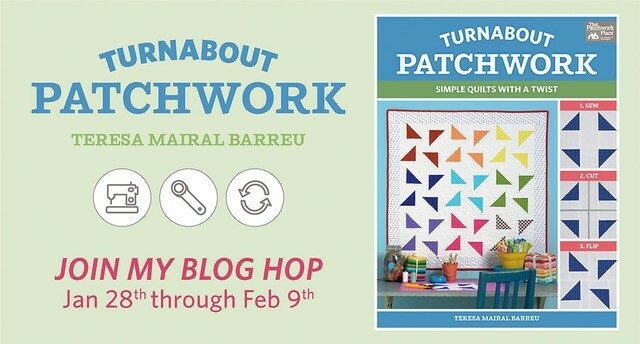 Turnabout Patchwork is a fun, new book by Teresa of Sewn Up, Teresa Down Under. 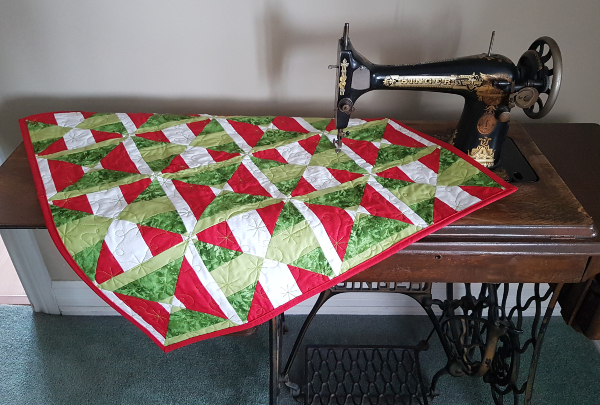 Teresa has lots of different quilts in the book, all made with very simple blocks that are then cut apart and sewn back together in a different arrangement to create quilts that look complex, but are still easy to piece together. I chose to make the Knots and Crosses variation of the Coordinated Strips block and the four fabrics came from my stash. 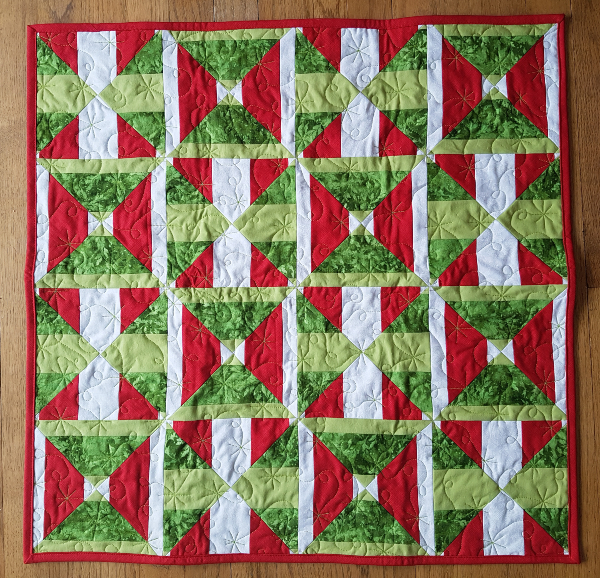 The mini quilt is made of 16 blocks and it measures 27" x 27". These are the original blocks. Then I cut them apart and stitched them back together to create the Knots and Crosses blocks. Teresa's directions are clear and it's crazy fun to cut the original blocks apart and use the parts to make something that looks so different. I considered doing a different free motion quilting design in each section, but when I really looked there are a lot of sections. Everything I considered putting in the sections would require starting and stopping a bazillion times and that really didn't appeal to me. 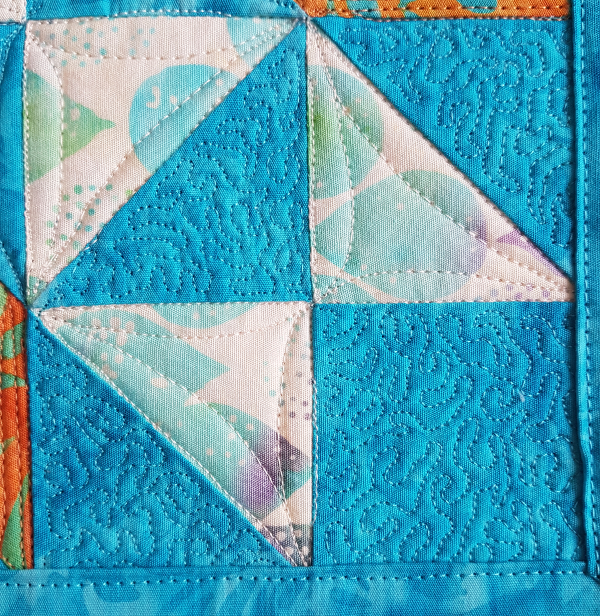 Then I remembered that all while I quilted my Sparkler quilt I had to keep reminding myself to make the sparkler lines asymmetrical so they wouldn't look like snowflakes. 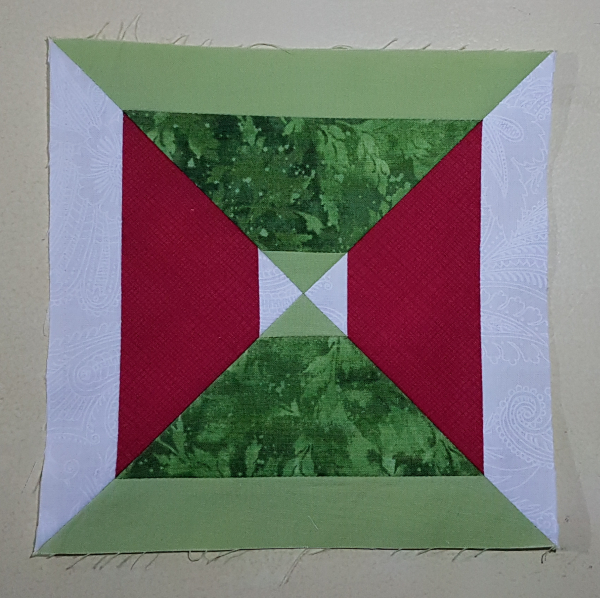 Flipping that around, if I made them symmetrical they would be snowflakes 😊 With the addition of some loops, I had a quick fmq design that was perfect for a Christmas quilt. 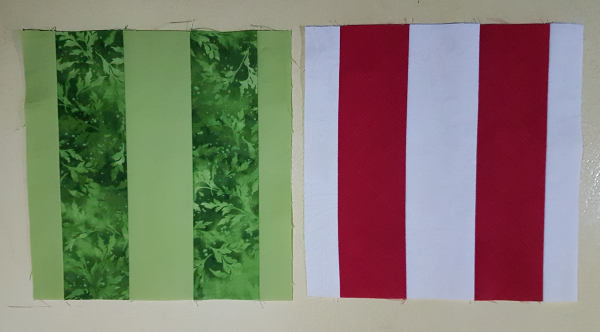 I used Aurifil 1231, Spring Green, and I love how it blends with some fabrics and contrasts in others. Have you been following along with the rest of the blog hop? There have been some gorgeous quilts shared already and there are more to come, so be sure to visit everyone! Before you do, though, you can leave a comment here for a chance to win a digital copy of Turnabout Patchwork, courtesy of Martingale 😊 To be entered, tell me what holidays you decorate for. 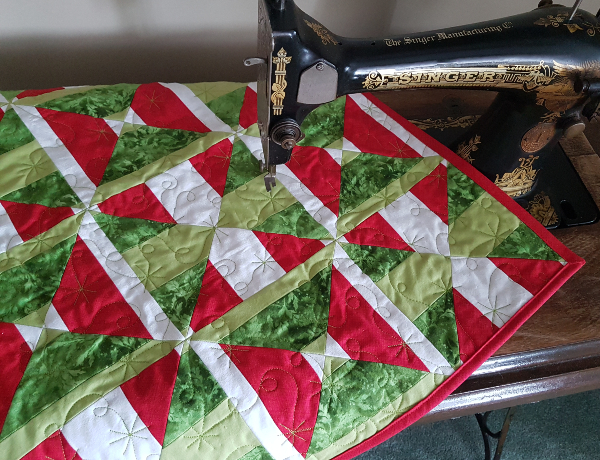 We only change things up for Christmas, but I'm considering adding other season decorations, mostly because I want to make more seasonal quilts, lol! Congratulations to the giveaway winner - comment #13 - Laura! Here's the full blog hop schedule so you can see all the beautiful things that have already come from Turnabout Patchwork. Happy blog hopping! A couple of years ago I met a woman who was staying in our town for a month while her husband did a work term here. We met up again a few days later at the library, where she had a stack of quilting books. Since she was a fellow quilter, I invited her to join our weekly quilting group. "Do you guys take sewing machines and everything?" she asked. I laughed. "We take our machines and cutting mats and bags full of fabric. We look like we're going on a long trip, but we're only going for 2 hours!" I remembered that conversation when I read Luke 9:3. Jesus sent out the 12 disciples to drive out demons, heal diseases and tell everyone about the kingdom of God. We don't know how long they would be gone, but Jesus had very specific packing instructions. " He told them: "Take nothing for the journey - no staff, no bag, no bread, no money, no extra tunic." What faith that must have taken. 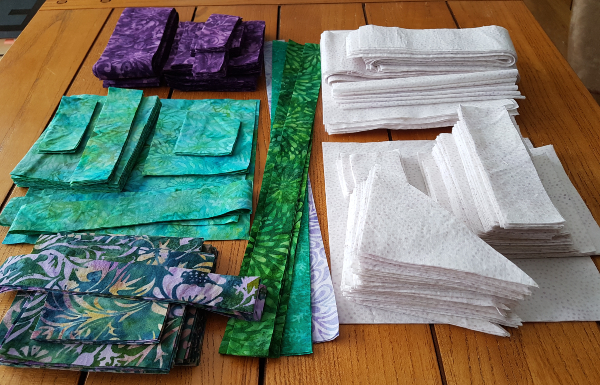 For me, a two hour quilting session requires as much equipment as I can carry. A weekend away with my husband and three boys takes four suitcases, plus another bag of books and toys. Even just a day trip means books and snacks, not to mention my hand stitching kit and Paul's coffee. Unlike for quilting, the Twelve didn't need special equipment. Jesus "gave them power and authority" (Luke 9:1) so they didn't need to carry anything to accomplish their mission. But Jesus told them not to take money, food or clothes. They left Jesus not knowing where their next meal would come from or who would welcome them into their home. Perhaps they were accustomed to that uncertainty. After all, they traveled with Jesus from town to town already. They were probably already familiar with how people welcomed and cared for visiting teachers. They had faith God would meet their needs. Fortunately, God still uses people to meet the needs of others. While I have never traveled empty-handed, bags of second hand clothes for our boys have been offered several times, usually just days after I realized most of their clothes were getting too small. It's not only our physical needs that God meets through other people. Paul wrote, "Praise be to the God of our Lord Jesus Christ, the Father of compassion and the God of all comfort, who comforts us in all our troubles so that we can comfort those in any trouble with the comfort we have received from God." (2 Corinthians 1:3,4) How many times has a friend's word of encouragement lifted my spirits just when I needed it? Generally speaking, we don't like needing help. 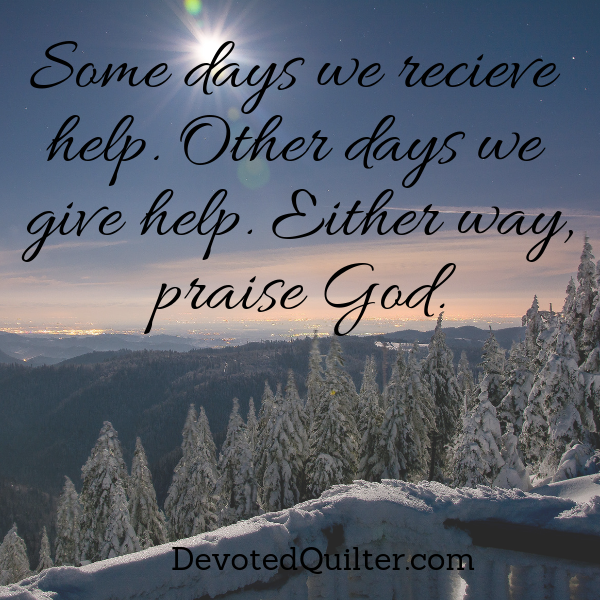 Many of us find it hard to ask for help, even after others have offered. We'd much rather be the ones doing the helping. Regardless of our preference, we can be sure that, over the course of our lives, we will have times when we need help and times when we can offer help. Which are you today? The one with needs or the one able to meet needs? If others are offering you help today, whether it be comfort, encouragement or material things, you can praise God for His provision. If you are helping others, praise Him for the extra He has given you so that you can give to others. Note, all of the fabrics and other things in this post were given to me as part of the Island Batik ambassador program. I am very excited to be an Island Batik ambassador again for 2019. 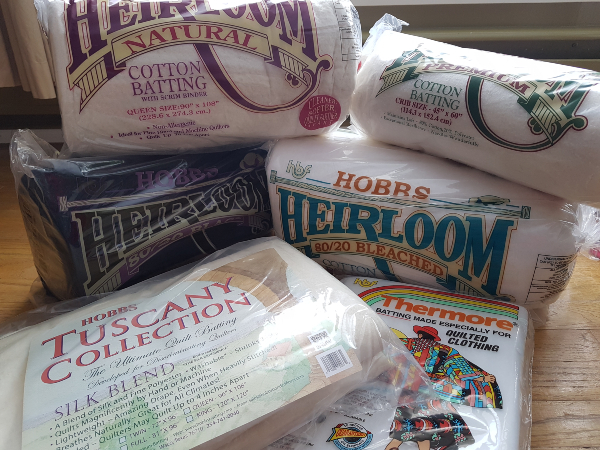 I loved using the gorgeous fabrics last year and I'm looking forward to it again this year and you'll see exactly why when you see what was in the box they sent me. Plus, the monthly challenges are a lot of fun and get me making things I might not otherwise have thought to make. 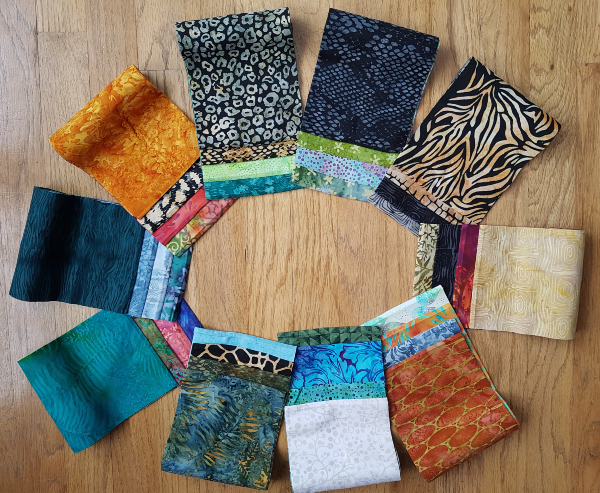 I've had my new box of fabrics for a couple of weeks now, but all of us ambassadors were asked to wait to share them until after the Getaway blog hop ended. Did you see all the fabulous projects during the hop? 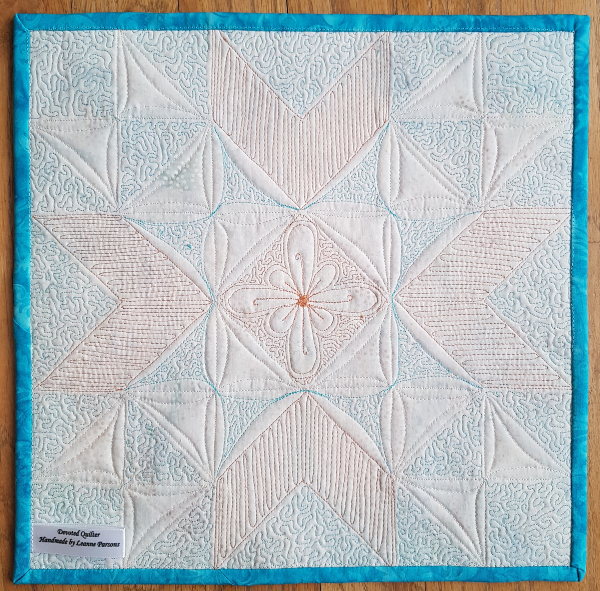 With so many ambassadors over a range of styles, there was a great variety of quilts 😊 There are links to all of the blog hop posts in my Sparkler quilt post. Now onto the new goodies! I filmed a video of everything that was in my box, but being on video is definitely not in my comfort zone. Just focus on the fabric and not my awkwardness, okay? Now let's get a good look at what was in the box. There's no picture of the surprise package since it has to stay a surprise until the August blog hop, but I will say that it's absolutely gorgeous and chock full of my favourite colour so I can't wait to get to play with it. 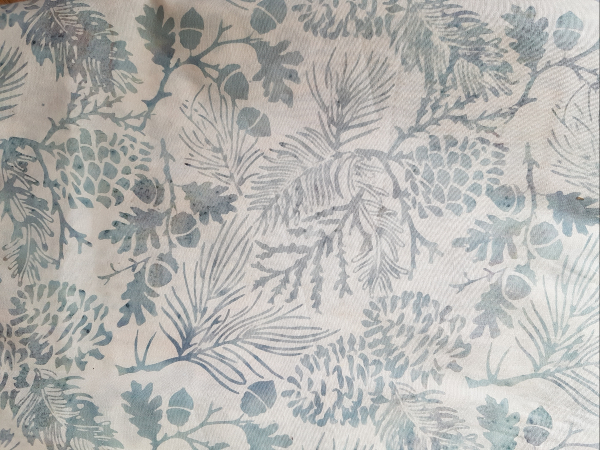 First up is this beautiful print, which is called Pine Leaf in Eggshell. They sent me 5 yards of it! I love it, but I'm not quite sure how I'll use it, since I don't often use large scale prints. This would be an example of the challenges getting me to make things I might not otherwise make. I'll put on my thinking cap and come up with a way to show off this print before the year is out. In the first box last year I received 2 yards of a rayon print that I turned into an Everyday Skirt that I love to wear when the weather is warmer. This box had another 2 yards of rayon, in a beautiful pink sunflower print. I haven't decided what it will become, but I'm thinking about a top of some sort. I just need to take some time to research pattern possibilities. I love the soft, drapey feel of the rayon and I can't wait to get to wear it. Also, pink! I'm finding more and more that I really love pink, just not a pastel pink. Maybe it has to do with living with 4 males?? Everyone knows that anything pink is definitely mine. Next we have the stash builder rolls. These are 5" x WOF strips, with 5 rolls in each package. As soon as I finished recording the video I opened the packages so I could get a look at all of the prints. They look beautiful all rolled up, don't they? They look even better unrolled so you can get a look at each print 😊 I've already cut into two of the strips for my February challenge. I have yardage of black, white and grey. 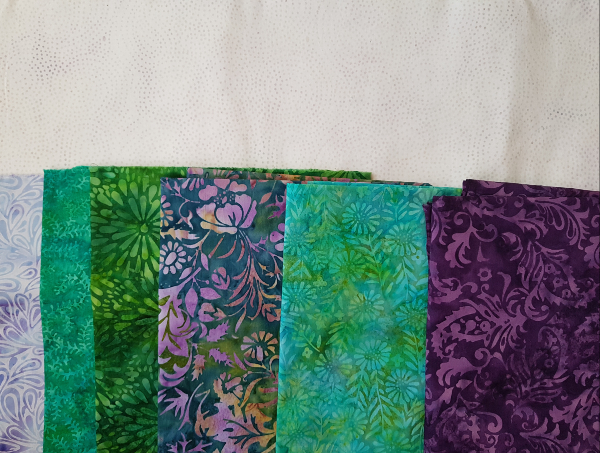 I love the Island Batik solids as they have a fabulous crispness to them. So far, I've used the white in my Twirling Star mini, the grey in Sparkler and the black in my Dresden Log Cabin. I have more plans for the black that I'm anxious to get to, but that challenge isn't until June so I guess I'll have to wait a while longer. On the ambassador application, there's a question about colour preferences. Last year I chose not to specify any because I wanted to see what they'd send me. It ended up working out really well as I loved everything they sent. This year, though, I did specify that my favourite colour is blue because there were some gorgeous blue collections last year and I wanted some of that in my life. My box this time had a collection of blues from the Foundations, which are fabrics that are always available for shops to order. Just look at the variety of blues, from very light to very dark! There are such great textures in the prints, too. 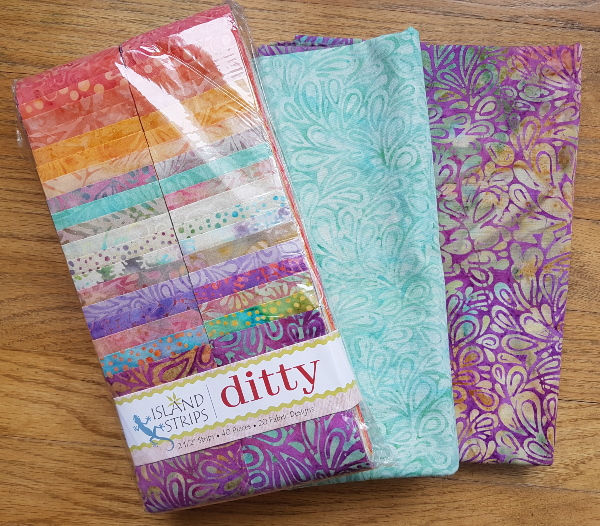 Here's a 2 ½" strip collection of Ditty, which is full of pretty prints in bright, fresh colours. The colours in this collection would play well with the Blossom line that I used for Sparkler. There's also yardage of two of the prints from the collection. Isn't that aqua pretty? 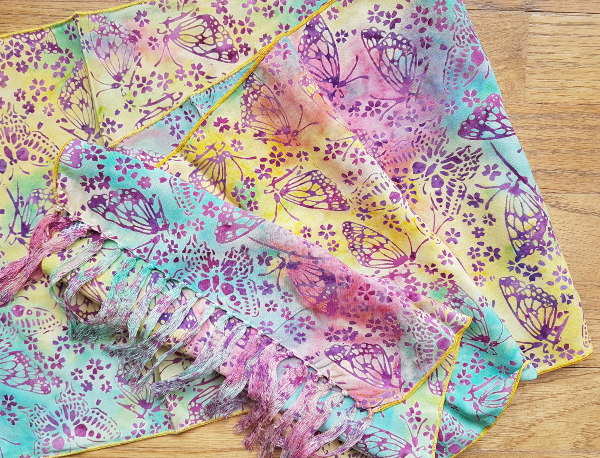 And there's a rayon scarf with butterflies in pretty spring colours. I love the colours and the print, but I'm not a scarf wearer, so I'm thinking of this (and the scarf from last year) as more rayon fabric to play with 😊 I'm not sure what they'll become yet, but they look pretty while they wait for me to figure it out! 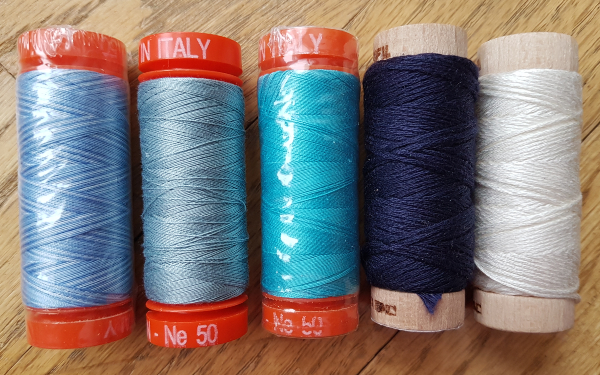 Aurifil is partnering with Island Batik again this year and they provided small spools of thread, 2 solid blues and one variegated, plus 2 spools of Aurifloss. I love hand stitching and hand embroidery, so I'm looking forward to getting to try the Aurifloss. Hobbs Batting is another partner and they sent a ton of batting. 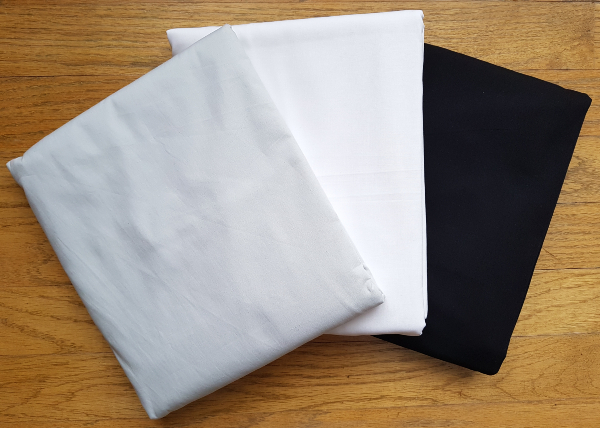 There are a few varieties, inlcuding a black batting, a silk blend and one very thin batting intended for quilted clothing. What would you make with that last one? Last, but not least, Accuquilt is a new partner this year and they surprised the ambassadors with a Go! 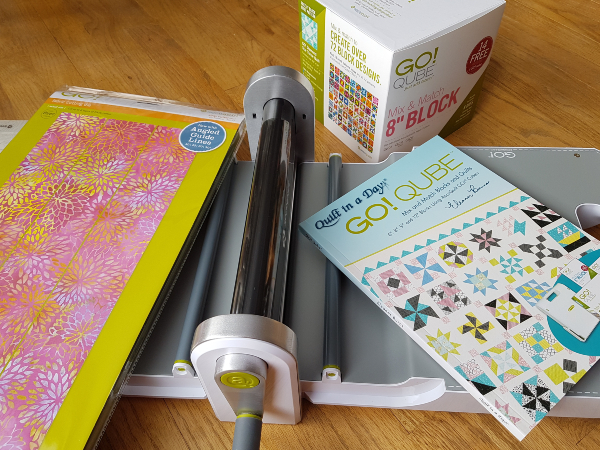 Fabric Cutting system, which includes the Go! cutter, a 2 ½" strip cutting die and the Go! Qube, which has 8 dies that can be used to create loads of different 8" blocks. If you look at the side of the box you can see little images of the blocks that you can make with these dies. There's also a book with patterns by Eleanor Burns using the 8 dies. Here's a list of all 50 of the 2019 Island Batik ambassadors. Yes, 50! Once again, we represent a wide range of styles, so it's going to be another great year of lots of beautiful and inspiring eye candy no matter what style you prefer. I highly encourage you to check them all out!